The current (green) 2017-2018 registration stickers are valid until May 31, 2018. The fee for the 2018-2019 registration sticker is $25.00, if purchased prior to May 31. All golf carts and utility vehicles inspected and registered after May 31 will be required to pay a $50.00 fee for the registration sticker, except for new purchases. The applications can be found here. They can also be picked up at the Momence Police Department. All golf carts and utility vehicles seeking a registration sticker must complete a registration application, and all vehicles seeking a registration sticker must have all the required equipment in working order. In 2009, the City Council passed an ordinance allowing the use of golf carts within the municipality. That ordinance was reviewed and modified in 2012 to include the use of some recreational off-highway vehicles as well, and again in 2016 to set-forth annual inspection and registration requirements. Important points in the ordinance include the requirements that all vehicles be equipped with proper safety equipment, be insured, and be licensed by registering the golf cart/utility vehicle annually. Read the ordinance here. The fee for registration is twenty-five dollars ($25.00) paid to the City of Momence, annual registration stickers are valid from May 1st through April 30th of each year. All registrations after May 31, with the exception of new purchases will be $50.00. 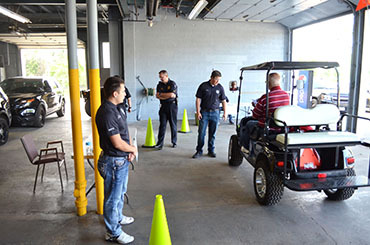 All golf cart/utility/off highway vehicles shall be licensed annually, during designated registration and inspection times in the month of May at the police department. Requirements for registering vehicles include, showing proof of ownership, proof of insurance, all municipal bills/fines paid, and all appropriate forms completed. In the course of registration, the owner shall pay a nonrefundable fee of twenty-five dollars ($25.00). The annual license shall be considered expired should the owner of a golf cart/utility/off highway vehicle, not register said vehicle at the designated times in May. The expired license registration nonrefundable fee will be fifty dollars ($50.00). The nonrefundable registration fee will be twenty-five dollars ($25.00) with a dated, proof of purchase document, for any golf cart/utility/off highway vehicles purchased during the fiscal year thereof. You may make an appointment with the Momence Police Department for Golf Cart/Recreational Off Highway Vehicle registration and inspections at the Police Station, 123 West River St. 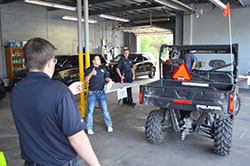 Applicants are to bring a completed application, proof of insurance and road-ready vehicle to the Police Department on their scheduled date of inspection/registration. Applications and detailed vehicle safety specifications can be obtained at City Hall, the Police Department, or fill out your application here. Fill out the first page of this form, then click "Print" at the bottom of Page 2, sign the form, and bring it with you to the inspection. 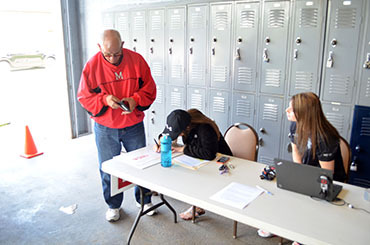 Left: Cadets begin the 2016 registration process. Right: Cadets perform inspection for required equipment.